Are you just itching to prove the real estate bears wrong and sink your teeth into a new property? If so, then Forbes.com has a list that might interest you. 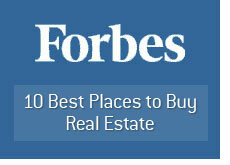 The publication just came out with a list of the top ten best places to buy real estate in the world. The list contains some cities that will not surprise you (New York), and some cities that will. The case for Washington, D.C. as the top real estate buy in the world? The nation's lowest unemployment rate and a new economic stimulus package that will make it very unlikely for that rate to dip anytime soon. There are some markets in this list (Los Angeles, San Francisco) that are strictly contrarian plays. These markets have been extremely hard-hit, but Forbes makes the case that a pick-up in sales volume means that a bottom is likely close. London seems to be an odd choice for this list, considering that the United Kingdom is absolutely under siege economically speaking. However, the article makes the case that London remains an attractive place to make a long-term purchase. Shanghai is included on the list because Forbes believes as though China will bounce back quickly once the global recession comes to a close. What do you think of Washington, D.C. being named as the most desirable place to purchase real estate in the world?